The Land aka Amber Fox: Dandelion Wine, Anyone? The laneway at Amber Fox is wild with dandelions. 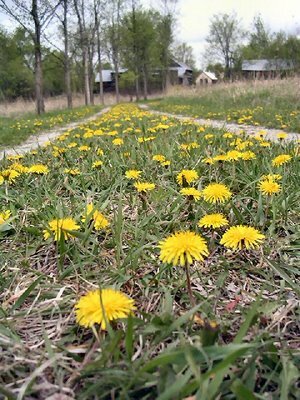 Dandelions are amazingly useful, and there's a great site called botanical.com, A Modern Herbal by Mrs. M. Grieve, that tells you many ways to prepare them, both for medicine and food. On the menu at Amber Fox today is dandelion salad and flower fritters. We'll let you know how it turns out. Some at Amber Fox are interested in wine of all kinds, and there's loads of information on The Winemaking Home Page. I like their slogan, "Dandelion wine is fermented sunshine." It seems there are as many recipes for dandelion wine as there are winemakers. 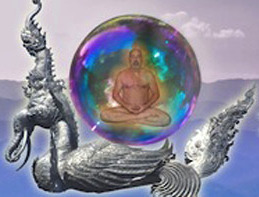 Here's one from the site that we may try. I hope you can get a a group to pick the yellow blooms at the gathering. Six months and the wine could be enjoyed in the late fall! Whoever took that photo from flower level -- do you need help getting up off the ground? Fabulous photo by the way! 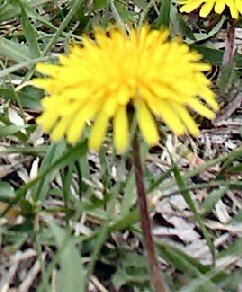 I'd be curious to try a sip of Dandelion Wine. I think Ray Bradbury wrote one of his spooky tales with that title. Witchy!